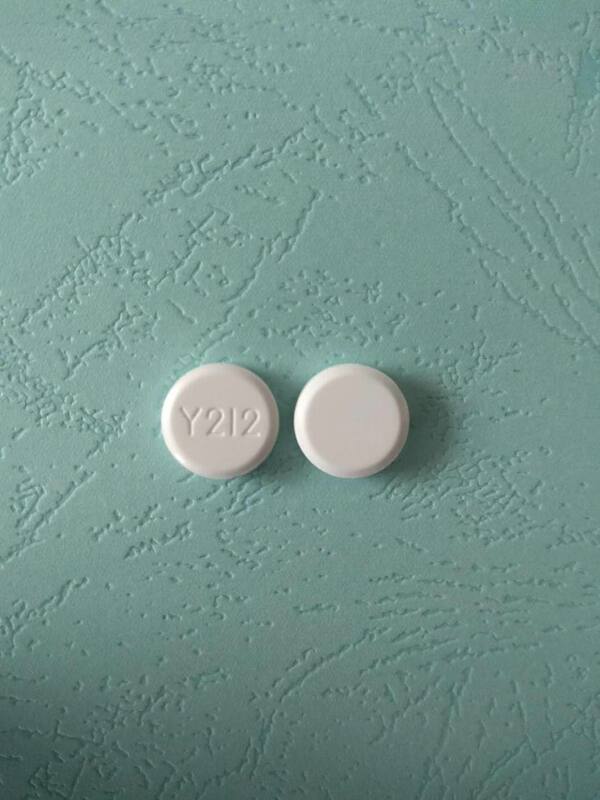 Proprietary Name: Acyclovir What is the Proprietary Name? 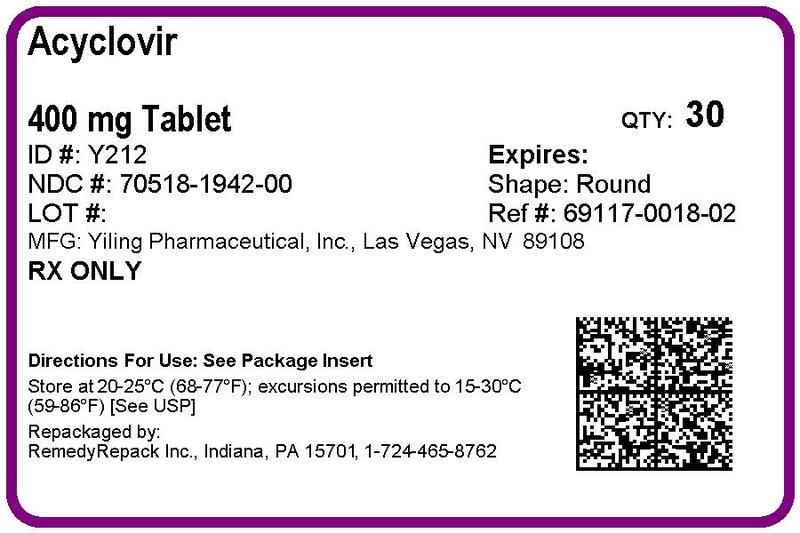 Non-Proprietary Name: Acyclovir What is the Non-Proprietary Name? Acyclovir with NDC 70518-1942 is a a human prescription drug product labeled by Remedyrepack Inc.. The generic name of Acyclovir is acyclovir. The product's dosage form is tablet and is administered via oral form. FDA Application Number: ANDA210401 What is the FDA Application Number? 3 and a molecular weight of 225. The maximum solubility in water at 37°C is 2.5mg/mL. 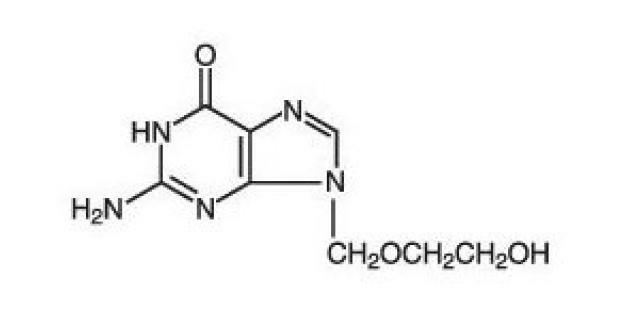 The pka’s of acyclovir are 2.27 and 9.25. 50 for acyclovir against most laboratory strains and clinical isolates of VZV ranges from 0.12 to 10.8 mcg/mL. Acyclovir also demonstrates activity against the Oka vaccine strain of VZV with a mean IC50 of 1.35 mcg/mL. Drug Resistance:Resistance of HSV and VZV to acyclovir can result from qualitative and quantitative changes in the viral TK and/or DNA polymerase. Clinical isolates of HSV and VZV with reduced susceptibility to acyclovir have been recovered from immunocompromised patients, especially with advanced HIV infection. While most of the acyclovir-resistant mutants isolated thus far from immunocompromised patients have been found to be TK-deficient mutants, other mutants involving the viral TK gene (TK partial and TK altered) and DNA polymerase have been isolated. TK-negative mutants may cause severe disease in infants and immunocompromised adults. The possibility of viral resistance to acyclovir should be considered in patients who show poor clinical response during therapy. ssTrough0.46 mcg/mL0.63 mcg/mL0.83 mcg/mLThere was no effect of food on the absorption of acyclovir (n = 6); therefore, acyclovir tablet may be administered with or without food.The only known urinary metabolite is 9-[(carboxymethoxy)methyl]guanine.Special Populations :Adults With Impaired Renal Function: The half-life and total body clearance of acyclovir are dependent on renal function. A dosage adjustment is recommended for patients with reduced renal function (see DOSAGE AND ADMINISTRATION).Geriatrics: Acyclovir plasma concentrations are higher in geriatric patients compared with younger adults, in part due to age-related changes in renal function. Dosage reduction may be required in geriatric patients with underlying renal impairment (see PRECAUTIONS: Geriatric Use).Pediatrics: In general, the pharmacokinetics of acyclovir in pediatric patients is similar to that of adults. Mean half-life after oral doses 300mg/m2 and 600mg/m2 in pediatric patients aged 7 months to 7 years was 2.6 hours (range 1.59 to 3.74 hours).Drug Interactions:Coadministration of probenecid with intravenous acyclovir has been shown to increase the mean acyclovir half-life and the area under the concentration-time curve. Urinary excretion and renal clearance were correspondingly reduced.Clinical Trials :Initial Genital Herpes: Double-blind, placebo-controlled studies have demonstrated that orally administered acyclovir significantly reduced the duration of acute infection and duration of lesion healing. The duration of pain and new lesion formation was decreased in some patient groups.Recurrent Genital Herpes: Double-blind, placebo-controlled studies in patients with frequent recurrences (6 or more episodes per year) have shown that orally administered acyclovir given daily for 4 months to 10 years prevented or reduced the frequency and/or severity of recurrences in greater than 95% of patients.In a study of patients who received acyclovir 400 mg twice daily for 3 years, 45%, 52%, and 63% of patients remained free of recurrences in the first, second, and third years, respectively. Serial analyses of the 3-month recurrence rates for the patients showed that 71% to 87% were recurrence free in each quarter.Herpes Zoster Infections: In a double-blind, placebo-controlled study of immunocompetent patients with localized cutaneous zoster infection, acyclovir (800 mg 5 times daily for 10 days) shortened the times to lesion scabbing, healing, and complete cessation of pain, and reduced the duration of viral shedding and the duration of new lesion formation.In a similar double-blind, placebo-controlled study, acyclovir (800 mg 5 times daily for 7 days) shortened the times to complete lesion scabbing, healing, and cessation of pain; reduced the duration of new lesion formation; and reduced the prevalence of localized zoster-associated neurologic symptoms (paresthesia, dysesthesia, or hyperesthesia).Treatment was begun within 72 hours of rash onset and was most effective if started within the first 48 hours.Adults greater than 50 years of age showed greater benefit.Chickenpox: Three randomized, double-blind, placebo-controlled trials were conducted in 993 pediatric patients aged 2 to 18 years with chickenpox. All patients were treated within 24 hours after the onset of rash. In 2 trials, Acyclovir Tablets was administered at 20 mg/kg 4 times daily (up to 3,200 mg per day) for 5 days. In the third trial, doses of 10, 15, or 20 mg/kg were administered 4 times daily for 5 to 7 days. Treatment with Acyclovir Tablets shortened the time to 50% healing; reduced the maximum number of lesions; reduced the median number of vesicles; decreased the median number of residual lesions on day 28; and decreased the proportion of patients with fever, anorexia, and lethargy by day 2. Treatment with Acyclovir Tablets did not affect varicella-zoster virus-specific humoral or cellular immune responses at 1 month or 1 year following treatment. Herpes Zoster Infections :Acyclovir tablets is indicated for the acute treatment of herpes zoster (shingles).Genital Herpes :Acyclovir tablets is indicated for the treatment of initial episodes and the management of recurrent episodes of genital herpes.Chickenpox:Acyclovir tablets is indicated for the treatment of chickenpox (varicella). Acyclovir tablets is intended for oral ingestion only. Renal failure, in some cases resulting in death, has been observed with acyclovir therapy (see ADVERSE REACTIONS: Observed During Clinical Practice and OVERDOSAGE). Thrombotic thrombocytopenic purpura/hemolytic uremic syndrome (TTP/HUS), which has resulted in death, has occurred in immunocompromised patients receiving acyclovir therapy. Dosage adjustment is recommended when administering acyclovir to patients with renal impairment (see DOSAGE AND ADMINISTRATION). Caution should also be exercised when administering acyclovir to patients receiving potentially nephrotoxic agents since this may increase the risk of renal dysfunction and/or the risk of reversible central nervous system symptoms such as those that have been reported in patients treated with intravenous acyclovir. Adequate hydration should be maintained.Information for Patients :Patients are instructed to consult with their physician if they experience severe or troublesome adverse reactions, they become pregnant or intend to become pregnant, they intend to breastfeed while taking orally administered acyclovir, or they have any other questions.Patients should be advised to maintain adequate hydration.Herpes Zoster: There are no data on treatment initiated more than 72 hours after onset of the zoster rash. Patients should be advised to initiate treatment as soon as possible after a diagnosis of herpes zoster. See CLINICAL PHARMACOLOGY: Pharmacokinetics.Carcinogenesis, Mutagenesis, Impairment of Fertility:The data presented below include references to peak steady-state plasma acyclovir concentrations observed in humans treated with 800 mg given orally 5 times a day (dosing appropriate for treatment of herpes zoster) or 200 mg given orally 5 times a day (dosing appropriate for treatment of genital herpes). Plasma drug concentrations in animal studies are expressed as multiples of human exposure to acyclovir at the higher and lower dosing schedules (see CLINICAL PHARMACOLOGY: Pharmacokinetics).Acyclovir was tested in lifetime bioassays in rats and mice at single daily doses of up to 450 mg/kg administered by gavage. There was no statistically significant difference in the incidence of tumors between treated and control animals, nor did acyclovir shorten the latency of tumors. Maximum plasma concentrations were 3 to 6 times human levels in the mouse bioassay and 1 to 2 times human levels in the rat bioassay.Acyclovir was tested in 16 in vitro and in vivo genetic toxicity assays. Acyclovir was positive in 5 of the assays.Acyclovir did not impair fertility or reproduction in mice (450 mg/kg/day, p.o.) or in rats (25 mg/kg/day, s.c.). In the mouse study, plasma levels were 9 to 18 times human levels, while in the rat study, they were 8 to 15 times human levels. At higher doses (50 mg/kg/day, s.c.) in rats and rabbits (11 to 22 and 16 to 31 times human levels, respectively) implantation efficacy, but not litter size, was decreased. In a rat peri- and post-natal study at 50 mg/kg/day, s.c., there was a statistically significant decrease in group mean numbers of corpora lutea, total implantation sites, and live fetuses.No testicular abnormalities were seen in dogs given 50 mg/kg/day, IV for 1 month (21 to 41 times human levels) or in dogs given 60 mg/kg/day orally for 1 year (6 to 12 times human levels). Testicular atrophy and aspermatogenesis were observed in rats and dogs at higher dose levels.Pregnancy:Teratogenic Effects: Pregnancy Category B. Acyclovir administered during organogenesis was not teratogenic in the mouse (450 mg/kg/day, p.o. ), rabbit (50 mg/kg/day, s.c. and IV), or rat (50 mg/kg/day, s.c.). These exposures resulted in plasma levels 9 and 18, 16 and 106, and 11 and 22 times, respectively, human levels. There are no adequate and well-controlled studies in pregnant women. A prospective epidemiologic registry of acyclovir use during pregnancy was established in 1984 and completed in April 1999. There were 749 pregnancies followed in women exposed to systemic acyclovir during the first trimester of pregnancy resulting in 756 outcomes. The occurrence rate of birth defects approximates that found in the general population. However, the small size of the registry is insufficient to evaluate the risk for less common defects or to permit reliable or definitive conclusions regarding the safety of acyclovir in pregnant women and their developing fetuses. Acyclovir should be used during pregnancy only if the potential benefit justifies the potential risk to the fetus.Nursing Mothers:Acyclovir concentrations have been documented in breast milk in 2 women following oral administration of acyclovir and ranged from 0.6 to 4.1 times corresponding plasma levels. These concentrations would potentially expose the nursing infant to a dose of acyclovir up to 0.3 mg/kg/day. Acyclovir should be administered to a nursing mother with caution and only when indicated.Pediatric Use:Safety and effectiveness of oral formulations of acyclovir in pediatric patients younger than 2 years of age have not been established.Geriatric Use:Of 376 subjects who received acyclovir in a clinical study of herpes zoster treatment in immunocompetent subjects ≥50 years of age, 244 were 65 and over while 111 were 75 and over. No overall differences in effectiveness for time to cessation of new lesion formation or time to healing were reported between geriatric subjects and younger adult subjects. The duration of pain after healing was longer in patients 65 and over. Nausea, vomiting, and dizziness were reported more frequently in elderly subjects. Elderly patients are more likely to have reduced renal function and require dose reduction. Elderly patients are also more likely to have renal or CNS adverse events. With respect to CNS adverse events observed during clinical practice, somnolence, hallucinations, confusion, and coma were reported more frequently in elderly patients (see CLINICAL PHARMACOLOGY, ADVERSE REACTIONS: Observed During Clinical Practice, and DOSAGE AND ADMINISTRATION). Herpes Simplex:Short-Term Administration: The most frequent adverse events reported during clinical trials of treatment of genital herpes with acyclovir 200 mg administered orally 5 times daily every 4 hours for 10 days were nausea and/or vomiting in 8 of 298 patient treatments (2.7%). Nausea and/or vomiting occurred in 2 of 287 (0.7%) patients who received placebo. Long-Term Administration: The most frequent adverse events reported in a clinical trial for the prevention of recurrences with continuous administration of 400 mg 2 times daily for 1 year in 586 patients treated with acyclovir were nausea (4.8%) and diarrhea (2.4%). The 589 control patients receiving intermittent treatment of recurrences with acyclovir for 1 year reported diarrhea (2.7%), nausea (2.4%), and headache (2.2%). Herpes Zoster:The most frequent adverse event reported during 3 clinical trials of treatment of herpes zoster (shingles) with 800 mg of oral acyclovir 5 times daily for 7 to 10 days in 323 patients was malaise (11.5%). The 323 placebo recipients reported malaise (11.1%).Chickenpox:The most frequent adverse event reported during 3 clinical trials of treatment of chickenpox with oral acyclovir at doses of 10 to 20 mg/kg 4 times daily for 5 to 7 days or 800 mg 4 times daily for 5 days in 495 patients was diarrhea (3.2%). The 498 patients receiving placebo reported diarrhea (2.2%).Observed During Clinical Practice:In addition to adverse events reported from clinical trials, the following events have been identified during post-approval use of acyclovir. Because they are reported voluntarily from a population of unknown size, estimates of frequency cannot be made. These events have been chosen for inclusion due to either their seriousness, frequency of reporting, potential causal connection to acyclovir, or a combination of these factors.General: Anaphylaxis, angioedema, fever, headache, pain, peripheral edema. Musculoskeletal: Myalgia.Skin: Alopecia, erythema multiforme, photosensitive rash, pruritus, rash, Stevens-Johnson syndrome, toxic epidermal necrolysis, urticaria. Acute Treatment of Herpes Zoster:800 mg every 4 hours orally, 5 times daily for 7 to 10 days.Genital Herpes:Treatment of Initial Genital Herpes: 200 mg every 4 hours, 5 times daily for 10 days. The frequency and severity of episodes of untreated genital herpes may change over time. After 1 year of therapy, the frequency and severity of the patient’s genital herpes infection should be re-evaluated to assess the need for continuation of therapy with acyclovir.Intermittent Therapy: 200 mg every 4 hours, 5 times daily for 5 days. Therapy should be initiated at the earliest sign or symptom (prodrome) of recurrence. Adjusted Dosage RegimenDose (mg)Dosing Interval200 mg every 4 hours>100-10200200every 4 hours, 5x dailyevery 12 hours400 mg every 12 hours>100-10400200every 12 hoursevery 12 hours800 mg every 4 hours>2510-250-10800800800every 4 hours, 5x dailyevery 8 hoursevery 12 hoursHemodialysis :For patients who require hemodialysis, the mean plasma half-life of acyclovir during hemodialysis is approximately 5 hours. This results in a 60% decrease in plasma concentrations following a 6-hour dialysis period. Therefore, the patient’s dosing schedule should be adjusted so that an additional dose is administered after each dialysis.Peritoneal Dialysis :No supplemental dose appears to be necessary after adjustment of the dosing interval.